Since February is LOVE month, I decided it was high time I showcased a sentimental DIY that I’ve been using most of my life – DIY Wooden Heart Magnets. You know I love magnets. I use them anywhere except on my refrigerator. Weird, I know. I just really like an uncluttered refrigerator door. Open the fridge up and all bets are off though! I’ve made matchbox car magnets, Santa belt magnets and souvenir penny magnets. 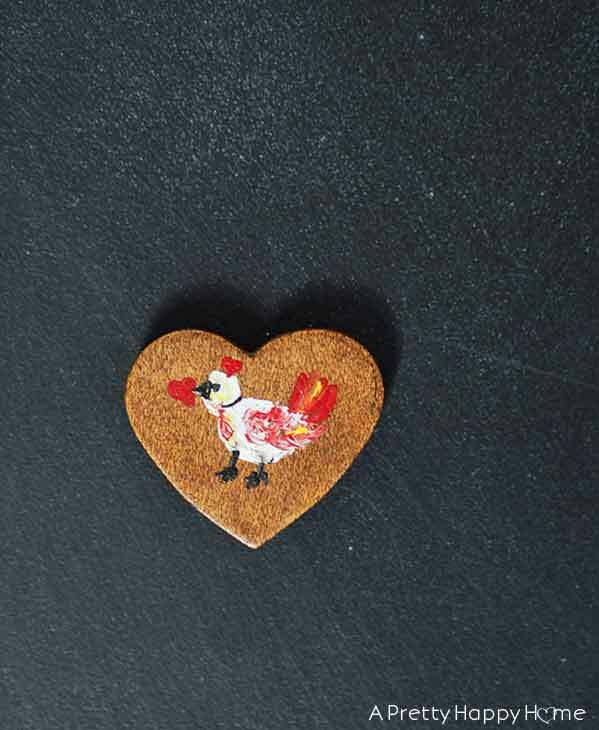 I come about this magnet love naturally because my mom is the one who DIY’d these wooden heart magnets. I’m guessing 30 years ago? Yes, they’ve lasted THAT long. She made these magnets and other crafts to sell at fairs and craft shows in the 1980s and early 1990s. If you think the ladies who sell Mary Kay cosmetics are intense, well, you never met my mother. There were all sorts of ‘rules of engagement’ for working her craft booth. There was no sitting in the booth – no matter how bad your feet hurt. No eating or drinking in the booth. No reading or other forms of entertainment were allowed – even if it was a slow day. You needed to greet everyone who walked by your booth in a genuine way without sounding too pushy or annoying. That’s as tricky to do as it sounds! Teenage Me thought a job at a fast food restaurant might have been easier (and more lucrative) than ‘helping’ mom work one of her shows. Adult Me realizes I was learning a lot about what it means to have a strong work ethic – even if I don’t come by some skills naturally. Life lessons aside, if you DIY something neat and long-lasting, do not discount the sentimental value that item will one day have for your children or grandchildren. My mom passed away a long time ago and these magnets remind me of her and that time we spent together. Is it silly? Probably. Is it special? Definitely. 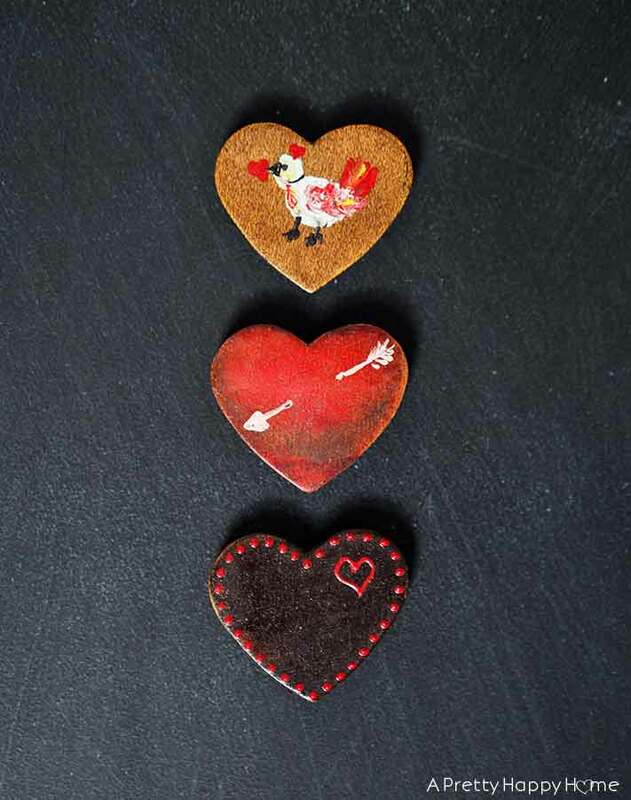 I’m not super into Valentine’s Day decorations, so I like that these heart magnets can work for Valentine’s Day, but they aren’t so over-the-top that you can ONLY use them for that holiday. If you want to DIY some wooden heart magnets for yourself or with your kids, it’s super easy to do. 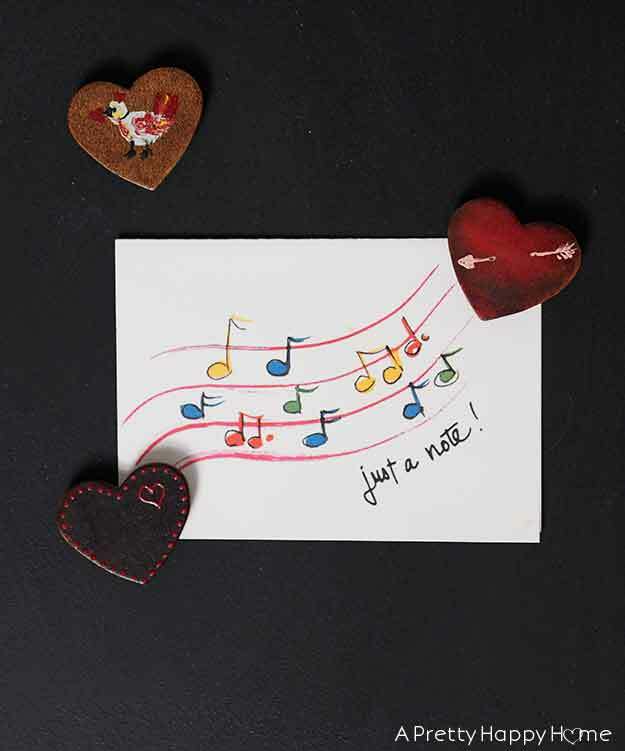 You’ll need to start with the obvious – procuring some small wood hearts. Paint or stain the hearts. Use whatever colors or designs make you happy. Glue on a magnet using a strong all-purpose glue or hot glue. Enjoy your magnets for years to come. *Affiliate links used in this post. We get credit if you use one of our links to make a purchase and it doesn’t cost you anything extra. It’s what keeps this blog afloat, so thank you! Thanks for taking time out of your day to read this blog! Here are some other posts you might enjoy. Your mom was quite the saleslady and always had a project on board. These hearts are nice. I’m glad you have some of her things that are close to our heart. Yes she was! She was definitely very passionate about the things she devoted her time to.